Somewhere along the Hayward Regional Shoreline, on a patch of marshy land covered with pickleweed, salt grass, and invasive mustard, I’m trying and failing to catch a glimpse of the California least tern. I’m not here alone. Julian, an East Bay Regional Park District intern, has accompanied me, and he’s already seen glimpses of three or four least terns through his binoculars. On the short but circuitous drive through the park’s network of tidal ponds, Julian pointed out a few of the many, many birds wheeling through the sky or flying low above the water: American avocets, western sandpipers, great egrets, a Canada goose strolling along the side of the road. But those aren’t the birds I’m looking for. 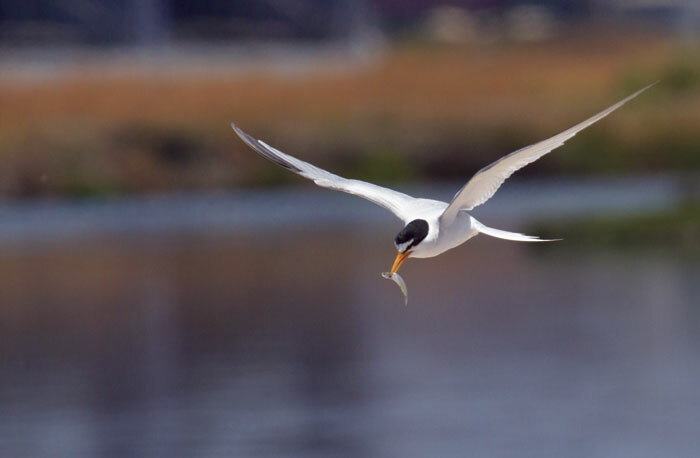 The California least terns only arrived at Hayward a week earlier, and there are now supposedly 20 of them in the vicinity of an island about half the size of a football field, situated within a pond of reclaimed and treated wastewater. District staff calls this oblong, three-quarters-of-an-acre landmass Tern Island, even though the name currently feels like a cruel misnomer. I train my binoculars on the cloud-speckled sky, hoping that one will fly into my field of view. They’re very small birds, Julian tells me almost apologetically, the smallest terns in North America. “They’re not the most accessible species,” he says. On this blustery late April morning, I can console myself with the fact that the terns aren’t out in full force yet, and won’t be for a couple more months. And my bad luck aside, the birds are difficult for even the most avid bird-watcher to see—we passed through multiple padlocked fences to reach this secluded spot, and Julian won’t let me get any closer to the island than the bank we’re currently on. In June, when the East Bay’s least tern population peaks, the nearby Alameda Wildlife Reserve, where another colony has grown, will host an event called Return of the Terns. The colony’s caretakers will open the site to the public for a single day, bringing busloads of people to marvel at the sight of a 700-bird-strong flock calling to each other and feeding their young. But before then, the terns need to fly up from Baja California and Central America, perform courtship rituals, pair up, build nests, lay eggs, and raise their chicks. Eventually, Julian sets up a scope and trains it on a least tern sitting obligingly still on a tiny landmass nearby. It looks like a smaller copy of the Forster’s tern sitting near it—black-capped head, orange beak, white body. It also looks a little bored, completely oblivious to the fact that humans all over the Bay Area are now rooting for it to find a mate, procreate, and successfully raise baby terns—because its species depends on it. It may look unassuming, but the Hayward colony is “a feather in the East Bay Regional Park District’s cap,” says Dave Riensche, the park district wildlife resource analyst who manages Tern Island. And no wonder: Of the 5,000-or-so breeding pairs of least terns in California, Hayward hosts around 80. But the colony is one of the top producers of least tern fledglings in the state. In 2014, it had the top fledgling/pair ratio: about 1.42 fledglings per pair. The state average hovers around half a fledgling per pair. “Our birds are making three times that,” Riensche says. That’s unusually good news for a bird that’s been on both the federal and state endangered species lists since they were created. When the California least tern, an endangered subspecies of the more ubiquitous least tern, was listed by the federal government back in 1970, the population was down to 600 pairs as a result of habitat loss, non-native predators, and disturbance. Forty years later, the population is ten times as large, and 41 least tern breeding sites are scattered throughout California. Most of the colonies are south of San Luis Obispo, near Los Angeles or San Diego. Alameda and Hayward are outliers, the two least tern colonies at the northernmost extent of the birds’ range. Riensche has worked at the East Bay Regional Park District for 27 years, and the idea for Tern Island has always been at the back of his mind. The genesis of the island lies with Riensche’s former professor, Howard Cogswell, an ornithologist and former member of EBRPD’s board of directors. “He took me under his wing,” Riensche says. He remembers Cogswell telling him that he needed to create a least tern colony. “They really need your help,” Cogswell said. By the end of 2005, there were eight nests on the island, following several nesting attempts foiled by predators. Then, starting in 2007, the numbers shot up. And in 2012, the colony saw a massive influx of least terns when kestrels and falcons attacked the nearby Alameda colony. Tern Island averages around 80 pairs a year—that year, they had 200. “I kid you not, it was beak-to-tail tern nesting,” Riensche says. “Unparalleled.” During that time, he’d stay up late making tern nest markers and eating pizza. “You go to sleep thinking you’re a tern,” he says. Cogswell died in 2006, just as Tern Island was starting to take off. “Since then, the colony’s just flourished,” Riensche says. Twenty miles northwest of Hayward, the Alameda tern colony is the biggest in northern California, and it’s here that least terns were first spotted in the Bay Area, in the 1970s. The site then was part of an active U.S. Navy base. Least terns are odd that way—they flee or get defensive at the slightest human or animal provocation, but seem to have no problem with cars, buses, or large aircraft screaming directly overhead. In fact, they seem to prefer airports. “The navy did a lot of weed control as well as predator control,” says Elliott, “because they didn’t want their planes running into big geese and whatnot out on the runway.” Two of the biggest colonies in the state are on military land in Southern California—Naval Base Coronado and Camp Pendleton, an active Marine Corps base. Nowadays, the tern colony at Alameda is nearly 10 acres of decommissioned airfield, a gravel area between runways that hosts around 350 breeding pairs a year. Along with Hayward, it’s one of the highest producers of fledglings in the state, says Susan Euing, the U.S. Fish and Wildlife Service biologist who manages the site. Riensche and Euing suspect that the success of the two colonies is linked, maybe even genetically. It’s likely, for one thing, that the least terns from Alameda kick-started the colony in Hayward. “Hayward is like the successful little brother or sister to Alameda,” Riensche says. In some ways, it’s totally unsurprising that California least terns are endangered—they’re one of those delicate animals whose needs are uniquely at odds with human development. They nest on undisturbed, remote sandy beaches devoid of plants—which just so happens to be the sort of place real estate developers like too. “Terns are visual animals,” Elliott says. If their ability to sight predators is obstructed by weeds, they simply won’t build nests in that area. There aren’t too many places like that anymore, and the ones that do exist are manmade: At both Hayward and Alameda, humans thoroughly weed the colonies—each and every year—before the terns get there. During tern season, Euing and Elliott perform surveys of the Alameda colony twice a week, early in the morning. Stepping carefully, they note the locations of the terns’ nests, the nests’ contents, how many chicks there are, and signs of predation—missing feathers or body parts. The terns, needless to say, don’t enjoy the intrusion. “It’s hard because you want to be thorough and you want to go slowly, but you also don’t want to be in there for a super long time and disturb the terns,” Elliott says. Some of the terns simply leave their nests and walk away. Others fly up and begin alarm calling, or they dive bomb the scientists by swooping at their heads or attempting to defecate on them. Elliott’s favorite response, however, is from a tern they’ve affectionately dubbed “Stalker Mom” (though they’re not sure if it’s male or female). “Stalker Mom employs both air and ground attacks,” she says. “She’ll flutter right above your head—we’re talking within a foot of your head, it’s close—squawking at you the entire time. When she gets tired of the air campaign, she’ll return to the ground and walk behind you, in front of you, beside you—all the time being very close to you (again, within a foot or so), wings out in a threatening position, and yelling at you.” The best part of studying these endangered birds is having one practically threaten to peck your eyes out. Over at Hayward, Riensche dispenses patches to the volunteers who help weed the island, install new shelters, and fix the chick fence. “We don’t want them if they don’t have passion,” he says. Riensche himself is usually out on the island three times a week during tern season. He gets there an hour before sunrise (“when bad things happen,” he says) and watches for predators. Then he rows himself onto the island proper in a small boat and does his own survey of the colony, checking up on the terns that have come to stay on the island he built for them. The ultimate goal — the endpoint of the work of Riensche, Euing, Elliott, and all those volunteers—is to get the least tern populations to be self-sustaining, so they can increase their numbers without quite so much human effort. And eventually, as with all endangered species, everyone wants the least tern to be taken off the list. But while overall numbers have gone up since the species was federally listed in 1970, and despite the success of the two northern colonies, the individual colonies’ populations are still up and down every year. “Different predators show up, we have issues up here with algal blooms, which could affect the fish supply, El Niño could affect the fish supply, we don’t know how it’s going to go year to year,” Euing says. “We’re doing as much as we possibly can.” For the foreseeable future, the terns are staying endangered. Riensche has more concrete worries about the future of his terns. The island is eroding away at an alarming rate — losing, by his calculations, ten feet in circumference over the last decade, thanks to wind and wave action from the tide. “It’s disheartening to put up a fence with 30 volunteers, and a year later, it’s all eroded into the water,” he says. “If we could stop the erosion, my hair wouldn’t be quite as gray.” In an ideal world, Tern Island would be expanded and surrounded by a riprap slope, a zone of small rocks around the island that would prevent the waves from eating away at it. The park district is currently looking into ways to restore the surrounding Hayward Marsh; depending on how quickly a decision is reached, that plan could include expanding and stabilizing the island.